Performance Boat Center/Jimmy John's wins Race World Offshore's second and final race of the season. Performance Boat Center/Jimmy John’s wins the second and final race of Race World Offshore’s season. 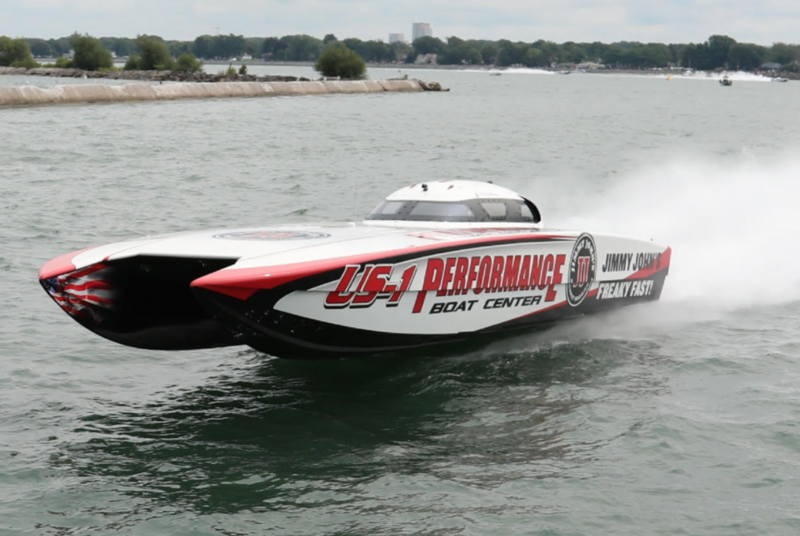 The Performance Boat Center/Jimmy John’s duo of driver Myrick Coil and throttleman John Tomlinson have won Race World Offshore’s second and final bout in its 2018 season. the Missouri-based team, driving its Skater Powerboats 388 catamaran powered by Sterling Performance engines, was triumphant in SuperCat class during RWO’s Offshore Great Lakes Grand Prix in Dunkirk, N.Y.
With a double-heat format, the two-time defending champions won the first round averaging 100.12 mph, while holding off the WHM Motorsports and Pro Floors Racing NZ-1 teams. New Zealanders Chris Hanley and Wayne Valder, in the Pro Floors Racing MTI catamaran, failed to insert their data logger card in the first heat and were penalized with a last-place finish. That moved the M-Con team, also based in Missouri, to third place. Valder and Hanley made up for their error and ran away from the field—turning several laps in excess of 105 mph—in the second heat. The Kiwis led every lap except for the first, with M-Con trailing closely. WHM Motorsports took third place and Performance Boat Center claimed fourth and went home in first place overall. In ProStock Cat class, the CR Racing team of Casey Boaz and Rob Unnerstall led all the way and took the checkered flag, averaging 93.6 mph over the 51.33-mile course. The co-owner and driver of the team, Rob Unnerstall, said a last- minute setup change—which he credited to Boaz—made the difference. Team Allen Lawn Care finished second in the class and FJ Propeller took third. Joined in the cockpit by well-known performance-boat owner Vinnie Diorio (the Wisconsin-based transportation company owner has an Outerlimits SV 43 sportboat), Brian Forehand returned the racecourse in a 29-foot Outerlimits dubbed Marker 17 Marine and took the win in the ProStock Vee class. The world-championship-winning boat was formerly owned by Michael “Doc” Janssen, who retired from the sport and sold the 29-footer—then called Watch Your Back— to Forehand, his former teammate. Team Octane took second place in the class. Photos for RWO by Freeze Frame. Interview: Terry Sobo of Marine Technology Inc.